Search Results for "sea buckthorn"
Sea buckthorn. Sea buckthorn bush. Ripe sea buckthorn berries. Close-up. Orange berries on spiny branches of Hippophae rhamnoides, common sea-buckthorn, in summer breeze. 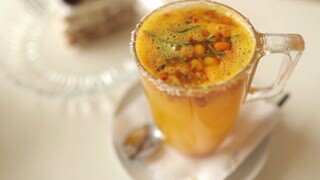 The fruits of sea buckthorn are used in a wide variety of products. 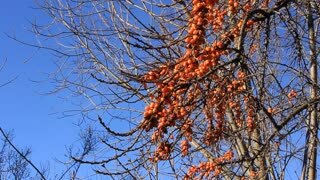 Orange berries on spiny branches of Hippophae rhamnoides, common sea-buckthorn, against blue sky. The fruits of sea buckthorn are used in a wide variety of products. Orange sea buckthorn tea in a teapot pouring into a cup on the table with woman hands. Top view on a azure plate with appetizing pancakes and orange sea-buckthorn berries on a wooden table, hands put a fork and a knife on a dish, the camera moves from right to left. Frozen branches of sea buckthorn with berries. Winter sunny day. 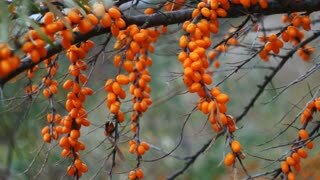 Sea Buckthorn berries on a branch with torns in a garden. Macro shooting of orange yellow common sea buckthorn berries heap with water drops rotating on the turntable isolated on the white background. Side view. Close up. Pile of orange yellow common sea buckthorn berries with water drops rotating on the turntable isolated on the white background. Side view. Close up.